Wallis and Futuna, officially the Territory of the Wallis and Futuna Islands (French: Wallis et Futuna or Territoire des îles Wallis et Futuna, Fakauvea and Fakafutuna: Uvea mo Futuna), is a French island collectivity in the South Pacific between Tuvalu to the northwest, Rotuma of Fiji to the west, the main part of Fiji to the southwest, Tonga to the southeast, Samoa to the east, the New Zealand-associated state of Tokelau to the northeast and to a more distant north the Phoenix Islands (Kiribati). Wallis and Futuna is not part of French Polynesia, nor even contiguous with it, as the former are located at the very opposite western end of Polynesia. Its land area is 264 km2 (102 sq mi) with a population of about 15,000. Mata-Utu is the capital and biggest city. 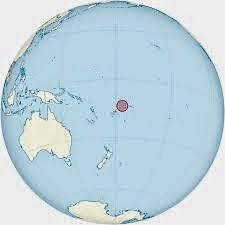 The territory is made up of three main volcanic tropical islands along with a number of tiny islets, and is split into two island groups that lie about 260 km (160 mi) apart, namely Wallis Islands (Uvea) in the northeast, and Hoorn Islands (also called the Futuna Islands) in the southwest, including Futuna Island proper and the mostly uninhabited Alofi Island. Since 2003 Wallis and Futuna has been a French overseas collectivity (collectivité d'outre-mer, or COM). Between 1961 and 2003, it had the status of a French overseas territory (territoire d'outre-mer, or TOM), though its official name did not change when the status changed. The GDP of Wallis and Futuna in 2005 was 188 million US dollars at market exchange rates. The territory's economy is limited to traditional subsistence agriculture, with about 80% of the labor force earning its livelihood from agriculture (coconuts and vegetables), livestock (mostly pigs), and fishing. About 4% of the population is employed in government. Revenues come from French government subsidies, licensing of fishing rights to Japan and South Korea, import taxes, and remittances from expatriate workers in New Caledonia, French Polynesia and France. Industries include copra, handicrafts, fishing, and lumber. In 1991, BNP Nouvelle-Calédonie, a subsidiary of BNP Paribas, established a subsidiary, Banque de Wallis et Futuna, which currently is the only bank in the territory. Two years earlier Banque Indosuez had closed the branch at Mata-Utu that it had opened in 1977, leaving the territory without any bank.